Account Number - Report the individual's complete and unique account number as extracted from your file. If you are changing an existing account number you will need to click on the "Change" button to the right of the field and enter in the new account number. The account number will be updated the next time you report to the credit bureau. Account Type - Account type that identifies the account classification. Refer to the reference section on Account Type Codes and Account Type Codes By Industry for detailed information. Portfolio Type - Type of account portfolio. Refer to the reference section on portfolio type for available values and their definitions. Date Opened - Report the date the account was originally opened. Retain the original Date Opened regardless of future activity, such as transfer, refinance, lost or stolen car, etc. Valid Dates Opened must be reported - field cannot be zero or blank filled, nor contain a date in the future. For companies who report returned checks, such as collection agencies, report the date of the check. Date Closed - For all portfolio types, enter the date the account was closed to further purchases or paid in full. For Line of Credit, Open or Revolving accounts, there may be a balance due. If not applicable, leave blank. Credit Limit - This field will only be active if the portfolio type is Line of Credit or Revolving. If this field is active report the assigned credit limit, report whole dollars only. If this field is inactive, grayed out, do not report a credit limit. Highest Credit or Original Amount (Largest Balance)- This value depends on the portfolio type for this account. For companies who report returned checks, such as collection agencies, report the original amount of the check, excluding fees and interest. Current Balance - Report the total current balance of the account, whether increasing or declining, in whole dollars only. This amount can include late charges and fees. Report credit balance (negative balances) as zero. For accounts that have a portfolio type of mortgage, report the principal balance plus the interest due this month. Do not include future interest, escrow, fees or insurance payments. Account Status - Report the account status that properly identifies the current condition of the account as of the Date of Account Information. Terms Duration - Contains the duration of credit extended. This value should be reported in months, years or other depending on the portfolio type of the account. Note: See the reference section on Terms/Payment Amount Conversion to Monthly for specific conversion information. 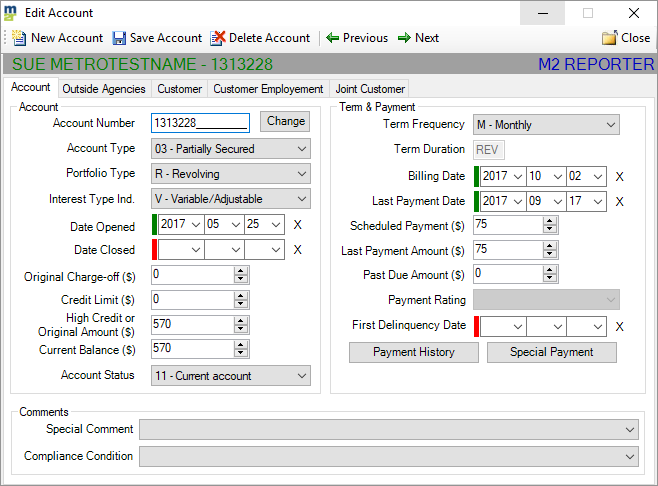 Date of Account Information (Also called Billing Date) - All account information, such as Account Status and Current Balance, must be reported as of the date in this field. Note: This date must not reflect a future date. This date should not change after the account has been reported as paid or transferred. Date of Last Payment - Report the date of the most recent consumer payment, whether full or partial payment is made. If the day is not available use 01 for the day. Scheduled Payment (Also called Scheduled Monthly Payment Amount) - Report the dollar amount of the scheduled monthly payment in whole dollars only. Amount you report will depend on the portfolio type of the account. Last Payment Amount - Report the dollar amount of the monthly payment actually received for this reporting period in whole dollars only. If multiple payments are made during the reporting period, the total amount should be reported. Amount Past Due - Report the amount past due in whole dollars only. This field can include late charges and fees. Do not include current amount due in this field. Payment Rating - This field will only be active for specific account status codes. If this field is active report the correct portfolio type. If this field is inactive, grayed out, do not report a credit limit. First Delinquency Date - The value to report in this field depends on the Account Status and Payment Rating. If you are reporting a Consumer Information Indicator this may effect the value you report also. This date is used to ensure compliance with the FCRA. See the reference section on Date of First Delinquency for detailed reporting instructions, examples and an excerpt from the law (FCRA). Note: First-time reporters should refer to the FAQ section for First Time Reporters. B = No payment history available prior to this time. A “B” may not be embedded within other values. D = No payment history available this month. “D” may be embedded in the payment pattern. If a full 24 months of history are not available for reporting, the ending positions of this field should be filled with Bs. The Payment History Profile is intended to be used to report monthly history, regardless of the Terms Frequency. Reporting of the Payment History Profile provides a method for automated correction of erroneously reported history. Exhibit 5 provides examples of reporting payment history. Specialized Payment Info - This option can be used to report information on specialized payment schedules for either deferred payment or balloon payments. Deferred Payment Date - Report the date the first payment is due for deferred loans. If the day is not available, use 01. This date is only reported when the Terms Frequency indicates Deferred. Balloon Payment Due - Report the date the balloon payment is due, if applicable. If the day is not available, use 01. Balloon Payment Amt - Report the amount of the balloon payment in whole dollars only. Paid accounts - refer to Frequently Asked Question 38. First-time reporters - refer to Frequently Asked Question 25. Special Comment - Used in conjunction with Account Status and Payment Rating to further define the account closed (e.g. closed accounts or adjustments pending). the special Comment Code must be reported as long as the condition applies. See the reference section on Special Comment Codes by Portfolio and Special Comment Codes for detailed list of codes and information of comments by portfolio. For examples of how Account Statuses, Payment Ratings and Special Comments interact, refer to Frequently Asked Question section. Compliance Condition - Allows the reporting of a condition that is required for legal compliance; e.g., according to the Fair Credit Reporting Act (FCRA) or Fair Credit Billing Act (FCBA). This condition may refer to accounts closed at consumer’s request, accounts in dispute under FCRA or accounts in dispute under FCBA. The code should be reported one time and will be deleted only when another Compliance Condition Code or the XR (Remove value) is reported. See Exhibit 14 for a list of Compliance Condition Codes and an example that demonstrates how to report these codes.